Ayrshire Golf along with Taylormade Golf US & Golf WRX hosted 4 lucky prize winners last week for a week of golf in a very sunny Ayrshire. 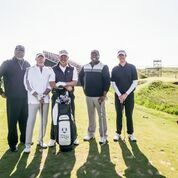 The winners where a pair of Fathers and Sons from the United States on there very first golf trip to Scotland and we can safely say that they loved every minute of it. s with us in Ayrshire staying at the fantastic Gailes Hotel and playing Western Gailes, Dundonald Links, Prestwick Golf Club and a visit to Trump Turnberry. The highlight of the trip however was playing Royal Troon with all The Open stands up. 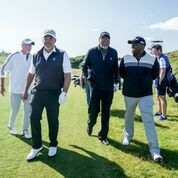 It didn't stop there, the lucky winners enjoyed 9 holes with Ryder Cup Captain and Past Open Champion Darren Clarke on a beautiful day on the links. Check out one of the prize winners tweet of excitement of what was described as a trip of a lifetime. We hope to see you back again guys!